Big property deals and new developments involving churches are on the rise, sources say, from Ebenezer Plaza in Brownsville to Trinity Church’s growing presence in Hudson Square. “Everybody is trying to see how they can partner in a joint venture with faith-based organizations to deliver more units,” said Osei Rubie, founder and president of the title insurance firm National Standard Abstract, which works with religious institutions on real estate deals. And those contracts are getting a boost from the city. Since 2014, the Department of Housing Preservation and Development has financed more than 2,000 housing units at 13 such projects, where it’s partnered with affordable housing sponsors. In some cases, the churches involved have sold their land outright to developers. More frequently, though, religious institutions are negotiating deals where they retain ownership of the property or the land’s title. Of course, churches have been major players in New York’s real estate world dating back to the early 1700s, when Queen Anne of England granted Trinity Church 215 acres of land. The Catholic church has long been one of New York’s major landowners, and Manhattan churches have spent years looking to sell and cash in on their air rights. But the city is now seeing activity pick up once again, with partnerships becoming all the more intricate. Sam Marks, executive director of the New York-based nonprofit the Local Initiatives Support Corporation, said one of the most significant decisions churches face these days is deciding what to do with their land — since that can heavily impact their role in those communities. “For the churches, it’s really a major existential question they have to ask themselves,” he said. Trinity Church, whose property arm owns more than 6 million square feet in Hudson Square, remains one of the most active religious institutions in the city’s real estate market. The Walt Disney Company paid Trinity Real Estate $650 million last summer for a five-parcel development site in the neighborhood, with plans to build a new headquarters for ABC and other media brands. And in August 2017, the church bought Tishman Speyer’s leasehold at 375 Hudson Street for $615 million — one of the priciest investment sales of the year. Trinity Church owns more than 6 million square feet of commercial property in Hudson Square in a joint venture with Norway’s sovereign wealth fund and Hines. Trinity also partnered with Norway’s sovereign wealth fund on its Hudson Square properties in 2015 in a deal that valued the commercial portfolio at $3.55 billion. The duo then brought on Houston-based Hines to operate the 11 office buildings. Representatives for Trinity did not return requests for comment. But Trinity is an outlier when it comes to church and private real estate partnerships, and New York’s property players don’t always treat their holy counterparts with reverence. Bishop R.C. Hugh Nelson, who’s working on Brownsville’s Ebenezer Plaza project with his Church of God of East Flatbush, said religious organizations sometimes get duped in high-pressure situations that cause them to act rashly— especially when they get to the point of selling or developing a property. “What happens, out of desperation, is they get engaged with business partners that sometimes are not scrupulous,” Nelson said. Churches and other religious groups that lack real estate experience can also end up signing unsustainable lease deals. Some landlords know this, the bishop maintained, but will accept an initial payment from a church, let it fix up the property and then kick the faith-based tenant out if it falls behind on rent payments. Often in those cases, the landlord will then lease the space to another tenant at a higher price, he said. That may also explain why religious institutions are becoming more real estate-savvy overall. Ebenezer Plaza — a 530-unit rental project that Nelson’s church is spearheading with affordable housing developers Brisa Builders Corporation and Procida Companies — is one of the several notable collaborations between church and real estate in New York right now. Religious organizations and developers can get matched up on joint ventures in a variety of ways, said Peter Procida, an executive at his family’s Bronx-based real estate firm. The process often involves some type of intermediary: a broker, a nonprofit group, or simply members of a congregation who happen to know developers. While these partnerships occasionally spring from developers belonging to the church they partner with, Procida said it usually comes down to who the church’s leaders feel they can trust the most with their land — typically their only asset. “The church is making their selection on who they’re going to partner with based on who they trust the most and who they think they’ll have a good relationship with,” he said. Brisa’s chair and CEO, Ericka Keller, cited several reasons why churches would look to sell their properties or team up with a private sponsor — from declining attendance to costly renovation needs. She also said many banks won’t lend directly to churches, since the majority lack a consistent revenue stream. With most joint ventures, the developer is responsible for making decisions about a project and evaluating its risk. And while churches usually have autonomy over any religious space a project includes, their involvement in the actual development tends to be extremely limited. “Keeping realistic timeframes and realistic expectations in terms of deliverables and everything, that’s kind of the trickiest part in working with [religious organizations],” Procida said. Churches typically have boards of trustees that are tasked with handling real estate issues and representing the congregation in such matters, according to those familiar with the matter. Nelson said the skyrocketing costs of living in New York led his church and others to get more involved in ground-up development. They broke ground on Ebenezer Plaza more than a year ago, having become interested in the project due to physical space constraints. Real estate has now become “a matter of survival” for smaller churches, the bishop said, adding that his congregation hopes the joint venture will help revitalize East New York. In 2017, the city began providing free real estate advice to faith-based organizations to help them navigate the industry’s cutthroat market. The initiative, dubbed the New York Land Opportunity Program, picked five churches from 33 applicants to kick things off. Church of God of East Flatbush is spearheading Ebenezer Plaza — a 530-unit rental project — with affordable housing developers Brisa Builders and Procida Companies. Keller cited Mayor Bill de Blasio’s plan to build and preserve 300,000 units of affordable housing by 2026 as one of the reasons religious groups are becoming more active in real estate. Some see contributions to affordable housing as a way to support their social missions. “We’ve definitely seen that there’s been an increase in interest and involvement in churches trying to find out if this is plausible,” Keller said, noting that religious groups are generally supportive of the mayor’s housing initiatives. She added that Brisa is currently working on 10 projects with churches. Since 2014, the company has completed work on 107 housing units through projects with faith-based organizations, and it has 436 under construction. That includes about 40 percent of Ebenezer Plaza, an 83-unit affordable housing project in the South Bronx and an 89-unit senior housing project in East Flatbush — both in collaboration with local churches. Churches and other faith-based organizations must receive “fair and reasonable” compensation for their land in any real estate deal and should get an independent appraisal of their property to ensure such an outcome, per guidelines from the New York state attorney general’s office. The AG regulates nonprofit organizations and has the final say on most of their real estate deals, a spokesperson for the state’s top legal office confirmed. Some hierarchical religions, including the Catholic Church, are exempt from review. But most churches need the AG’s consent before finalizing any major transactions. Even with that regulatory oversight, though, religious organizations large and small can still run into problems with real estate deals. After the city approved the Midtown East rezoning in 2017, for instance, the Archdiocese of New York gained more leeway to sell its air rights at St. Patrick’s Cathedral — roughly 1 million square feet between East 50th and East 51st Streets and Fifth and Madison Avenues. Early last year, St. Patrick’s did just that by agreeing to sell 30,000 square feet of air rights to 405 Park Avenue owners Deutsche Bank and MRP Realty for about $10 million. That would allow the owners of the 17-story tower to tack on four floors and 205,000 square feet of additional office space. But the agreement didn’t last long. The Brook, an exclusive men’s club on East 54th Street, swooped in last summer and undercut the archdiocese’s price with its own deal. Since the club is located right next door to 405 Park, it could sell its air rights under pre-rezoning rules without needing to pay into a city fund for public upgrades. Brian Strout, of the air rights and land assemblage advisory firm City Center Real Estate, said he wasn’t surprised the Brook was able to step to the negotiating table with a more appealing offer. “Generally, the private group has a little more flexibility in what they consider,” he said. In other cases, churches have come out of tense real estate bids on top. In Morningside Heights, for instance, a seven-story building that was poised to go to a private developer ended up going to a religious institution instead when Riverside Church bought it for $46.5 million. Union Theological Seminary was using the building at 97-101 Claremont Avenue as a dormitory, and BCN Development was reportedly in contract for the site. But the local church stepped in last fall, citing a restriction imposed by John D. Rockefeller that gave it a right of first offer to buy the property. 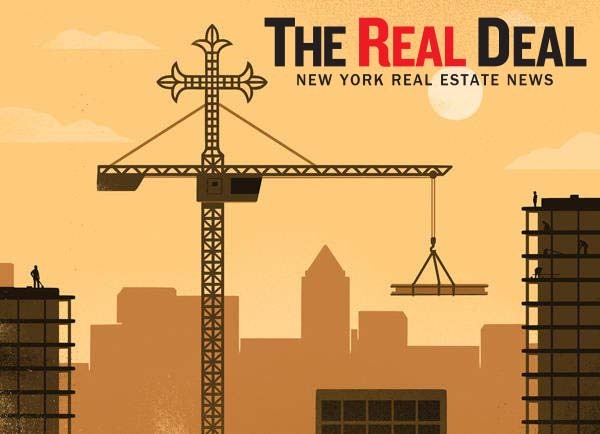 Overall, the biggest value that churches bring to New York’s real estate market is that most have owned their land for a long time without putting much equity into it, Goldstein Hall’s Hsu said. That allows some religious organizations to reap the benefits of a sale or a joint venture with property values still at a premium.